Face-to-face meetings were the principal draw for many at the Biotechnology Industry Organization’s convention in Boston this week. Atul Saran, a senior vice president of the biotechnology company MedImmune, planned to “churn through” eight to 12 meetings a day during the BIO convention in Boston, which ends its four-day run on Thursday. Michal Preminger, executive director of Harvard University’s Office of Technology Development, had 70 BIO meetings entered into the scheduling software on her Apple iPad. And Christine Menjoz, project director of strategy and business development at Sanofi, is meeting only with new companies at BIO, so her pace has been just six or seven meetings a day. The sprawling Biotechnology Industry Organization conference, held at the Boston Convention & Exhibition Center, features high-profile keynote addresses, dozens of industry panels and breakout sessions, nightly networking soirees, and hundreds of booths and pavilions in the exhibition hall. But the main events for many attendees are dozens and dozens of “partner meetings” with other companies and institutions. This year, some 5,500 individuals from 2,900 companies have paid between $400 and $1,000 for BIO’s speed meeting service, which includes the BIO One-on-One Partnering scheduling software and access to the Business Forum meeting area. About 25,000 meetings have been arranged, double the 12,103 meetings that took place in 2007, the last time BIO was in Boston. Biotechnology executives meeting in Boston voiced concerns about potential research cuts and the future of the health care law. Meetings are such an integral part of the convention that BIO offers a software platform to help attendees fill their calendars with cascades of half-hour meetings months in advance. 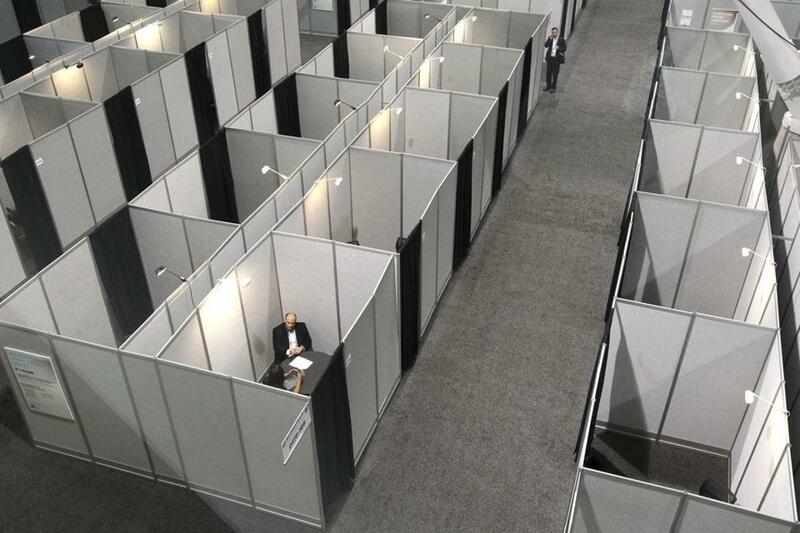 The organization also devotes more than a quarter of the convention’s 516,000-square-foot exhibition floor to 400 tiny, 8-by-12-foot gray “partner booths” with black fabric doorways. “It’s like speed dating,” said Saran. Saran believes the additional fees are worthwhile. No other trade group offers partnering meetings on that scale, said Alan Eisenberg, executive vice president of emerging companies and business development at BIO. 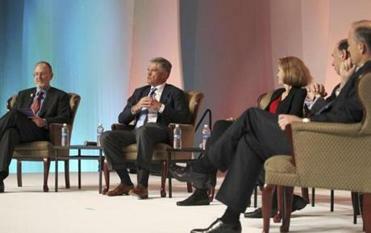 Managing a BIO meeting schedule is “a bit of an art,” said Preminger, who has attended 15 BIO conventions. She starts planning a few months in advance, using BIO’s software to contact companies that might be interested in working with Harvard. Preminger uses dozens of search terms — like cancer, neurobiology, vaccines, and diagnostics — to find companies that may be worth a meeting. This year, she sent out 450 requests, which she winnowed down to 70 actual meetings. When two participants agree to meet, the BIO system automatically assigns them one of the tiny meeting rooms for a half-hour. The charmless gray cubes, one size up from voting booths, each contain four chairs and a circular table. The rooms are “absolutely devoid of charisma,” said John Trainer, a senior director of business development at MedImmune who has been logging 10 to 15 meetings a day in the drab grid. The meetings were conducted nonstop from 8 a.m. to 5 p.m. every day until Thursday, when the convention closes after a half-day. Every 25 minutes, a blast of music — on Wednesday, it was from the soundtrack to the Boston-based movie “The Departed” — warns people in meetings that it’s time to move on. They then have five minutes to get to their next meeting. It’s a grueling schedule, but attendees aren’t complaining. Nor are these biotech professionals looking for alternatives, despite the high-tech nature of their work.